Should You take Pregnancy Diarrhea Medication? No antidiarrhea medications (even those obtained over-the-counter) should be taken without your doctor’s advice. 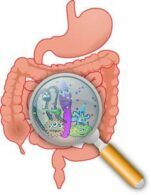 Increased intestinal motility and consequent diarrhea is the body’s natural way of getting rid of harmful bacteria and toxins in the intestines. Medicines that slow down intestinal motility or cause the infected material to remain longer in the intestines may actually be dangerous because they prolong the time the bacteria and toxins remain in the intestines. discomfort or the woman is in danger of dehydration, most doctors suggest their patients not use antidiarrheas. The combination of kaolin and pectin (Kaopectate), even though it is safe to take during pregnancy, is not very helpful. Imodium A-D is a more effective pregnancy diarrhea medication, and is reported to be safe to take during pregnancy. Still, it may be better to allow the intestines to rid themselves of bacteria and toxins naturally, so we have put these two medications in the “yellow light” or caution category. However, if your doctor feels that it would be better in your situation to slow down the diarrhea, Imodium A-D may be the best choice. Pepto-Bismol contains salicylate (similar to that found in aspirin), which may cause bleeding in mother and/or baby; Bismuth has been linked to birth defects in experimental animals. Neither of these medications is regarded as safe to take while pregnant. If you are in danger of becoming dehydrated from vomiting and/or pregnancy diarrhea, and your illness does not seem to be self-limiting, your doctor may choose to rehydrate you with intravenous solution that can be administered over several hours while you are an outpatient in the doctor’s office or in an emergency room.